July 1st to many of us is the countdown to the end of term and the beginning of our summer plans, but on Friday our families attention was drawn away from our everyday life as we were taken back 100 years along with many other by standers to witness a moving scene throughout the UK. 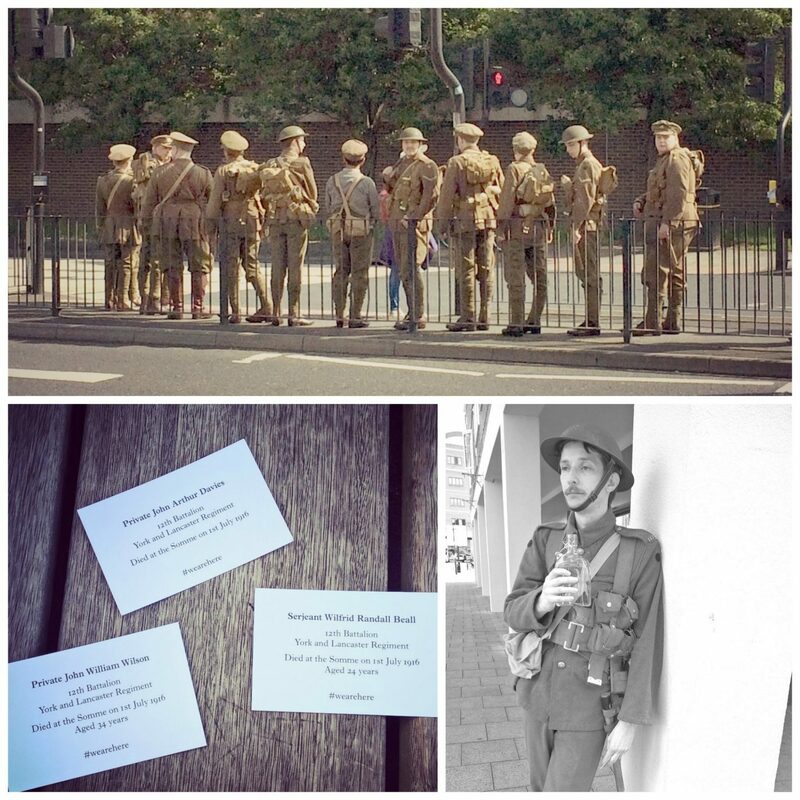 It was a piece of living art commissioned by 14-18 NOW which depicted young men dressed in WW1 uniform appearing silently and wandering through our train stations, shops and streets. Thousands of volunteers took part in this UK-wide event as a modern memorial to mark the centenary of the Battle of the Somme. The work was conceived and created by Turner Prize-winning artist Jeremy Deller in collaboration with Rufus Norris, Director of the National Theatre, and it combined 2 of my personal passions…theatre and history! “Not one spoke to me, just each handed me their card as they stared past me and I looked upon it to see who they were and when they were killed! 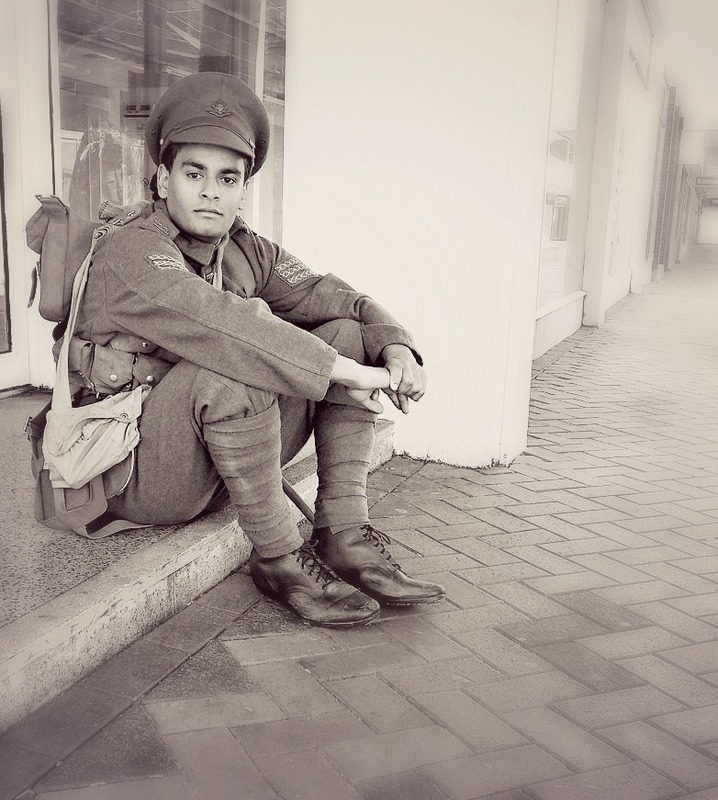 I have said before how the great wars and post war period are one of my favourite historic periods to learn about, read about and see things about. I think that living in our day, with so many luxuries, wasted food and freedom we can never truly comprehend what war torn Britain was like, and the strength of those from that period genuinely fascinates me. The thought of fear and mass genocide is harrowing and humbles me, and there is no way we could ever ever imagine the horror of what being in the trenches was ever like…and thankfully we do not have to. These men lived what we can only try to imagine, and this campaign paused our world to remember theirs. 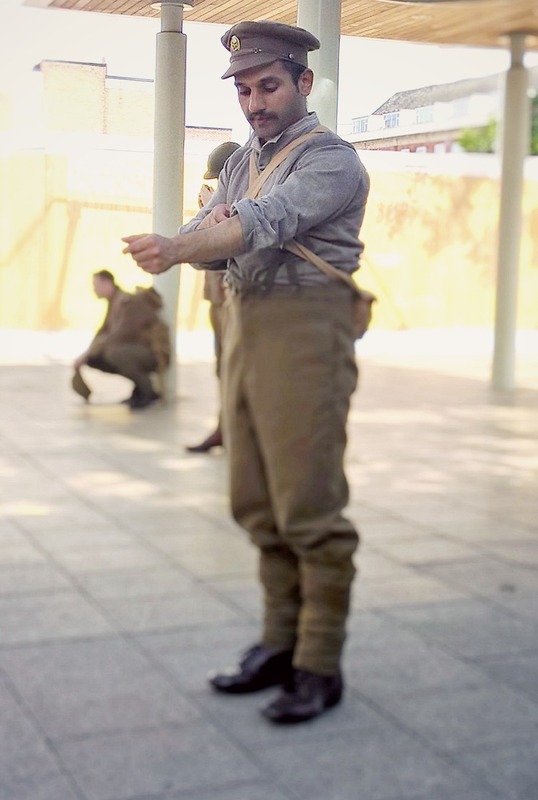 It briefly drew our attention to this sobering act of sacrifice as these silent WW1 soldiers, all volunteers and men aged between 16-52, took time to portray the men who would have fought in the Somme. They were not trained actors but come from a range of professions, including a sheep farmer, flight attendant, doctor, lawyer, social worker, shop assistant, portrait artist and GCSE student. They came together to rehearse in theatres across the UK over a month-long period in the run-up to the performance. The daylong work ran from 7am to 7pm and covered the width and breadth of the UK, from Shetland to Plymouth. Sites they visited included shopping centres, train stations, beaches, car parks and high streets – taking the memorial to contemporary Britain and bringing an intervention into people’s daily lives where it was least expected, and thus causing people to stand still, to reflect and to remember each individual that fell that day. I am grateful we were some of those who were paused in our own tracks, it certainly was a powerful sight to see and we were moved by this poignant scene, thankfully able to take some time to follow them on their journey where members of the public cleared a path in awe to let them through. ‘We’re here because we’re here’ was made possible by an Ambition for Excellence Award from Arts Council England and by the Heritage Lottery Fund, with additional support from Paul Hamlyn Foundation, Creative Scotland and Art Fund. 14-18 NOW is principally funded by the National Lottery through the Heritage Lottery Fund and Arts Council England, and by the Department for Culture, Media and Sport, it was the first time 3 national theatres had worked together on such a project and the results, if you were a witness of it, were truly touching and thought provoking. For this one day we paused our lived and reflected on WW1, we had an opportunity to stand still and to remember a time of unity and sacrifice by our nation. 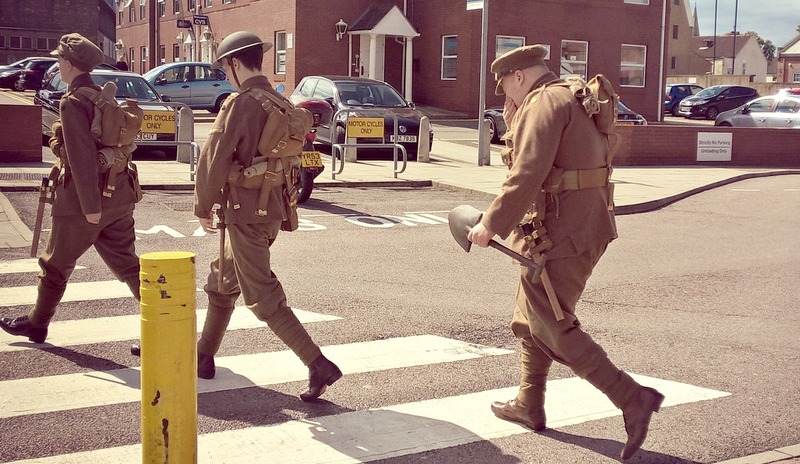 We watched them walk away remembering they would never have returned and Twitter went mad with the #WeAreHere as people shared their own experiences, pictures and emotions surrounding these scenes that were sprung upon them. It was magnificent, it was powerful, but it was rare, and I hope as we look upon these scenes around social media we can see the bigger picture… we can appreciate what thought and planning went in to pull this off in remembering every single one of those almost 20,000 men that fell for us. Let us each pause to remember that we are here because of them. 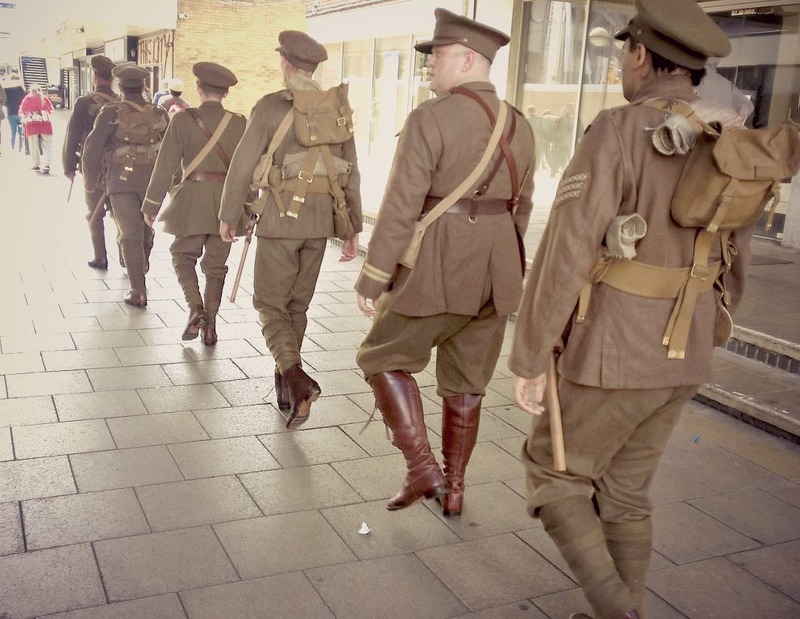 If you missed it or want to see how others reacted then visit www.becausewearehere.co.uk where all shared videos, pictures and reactions from the public have been collected as well as further insights into the Somme. Wow, this is amazing. It really brings a lump to your throat. Wow that’s amazing and very special too. An emotional history in your family.